Product #1631 | SKU 1419574 | 0.0 (no ratings yet) Thanks for your rating! 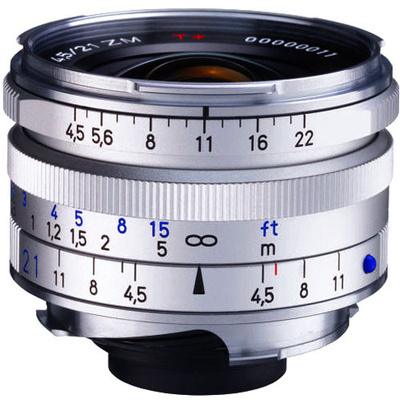 Based on a classic design from 1952, the silver C Biogon T* 21mm f/4.5 ZM from ZEISS is a super wide-angle prime for M-mount rangefinder cameras. Its 'C' designation reflects the lens's compact form factor and classic optical design to produce imagery with true colour fidelity and natural rendering. The Biogon optical concept helps to ensure virtually no distortion, and this eight elements, six groups layout also maintains a high degree of sharpness and clarity. Additionally, a T* anti-reflective coating has also been applied to reduce lens flare and ghosting for improved contrast in strong lighting conditions. Type 'C' lens refers to this lens's classic aesthetic and compact design that recalls its predecessor from 1952. The glass and coatings have been updated to contemporary standards, however it still produces a timeless look well-suited for both film and digital use. Biogon optical concept benefits the super-wide focal length by helping to virtually eliminate distortion for clean, realistic rendering. Manual focus design enables a minimum focusing distance of 50 m.